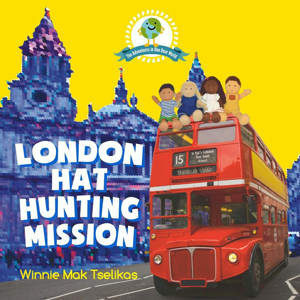 Welcome to my stop on the tour for The London Hat Hunting Mission by Winnie Mak Tselikas. It’s a lovely book for children and I’ll be reviewing it today and also sharing details of a giveaway. 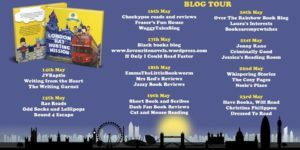 Thank you to Rachel Gilbey from Rachel’s Random Resources for the place on the tour and One Dear World for the review copy. Four little Londoners, Hope, Jun, Lea and Parth, come from a different cultural background, are good friends living in London. They are travelling to the iconic places around the city in search of magic hats to cure Mr Globe’s headache. The book is illustrated with a mix of real life photographs of iconic places in London and digital illustration so children can have a vivid visual experience of London and at the same time open up their world of imagination. I read The London Hat Hunting Mission with my four year old son. He had already read a book previously in which some London landmarks were featured and so I thought this was an ideal follow-up to that. He did recognise some of the landmarks, such as the Tower of London, the London Eye and Big Ben. It’s quite an unusual book in that the characters are dolls. The very first page talks about diversity in London and each of the five characters are introduced. There are four of the dolls, all of different nationalities and colour. The fifth character is Mr Globe. They all play together until Mr Globe falls ill and they have to travel around London looking for different hats to heal his head. Their search takes them to different areas of London to collect a variety of hats, such as a bearskin from Buckingham Palace and a rasta tam from Portobello Road. There are lots of colourful photographs showing the dolls at all the different landmarks. It’s a vibrant and interesting book for children to read and it’s so nice to see diversity being promoted in a children’s book. My son really enjoyed it and at the end he was able to follow the route the characters took on the Hat Hunt Map. Overall, it’s an educational, fun and lively read. *Terms and Conditions – Please enter using the Rafflecopter box below. The winner will be selected at random via Rafflecopter from all valid entries and will be notified by Twitter and/or email. If no response is received within 7 days then I reserve the right to select an alternative winner. Open to all entrants aged 18 or over. Any personal data given as part of the competition entry is used for this purpose only and will not be shared with third parties, with the exception of the winners’ information. This will passed to the giveaway organiser and used only for fulfilment of the prize, after which time I will delete the data. I am not responsible for despatch or delivery of the prize. Winnie Mak Tselikas is a believer in diversity. Born and raised in Hong Kong, she studied engineering, worked in commercial sales and in 2011 switched to education upon moving to London. There, she met her half-French, half-Greek husband and they had a son, who now has family in China, France, Greece, HK, the UK and the US. Winnie considers her son to be a world citizen rather than of a particular nationality or culture. 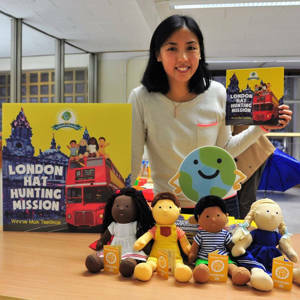 Inspired by her family and London’s diversity, she founded One Dear World and created the lovely adventures of Mr. Globe and the little Londoner dolls.